Wake up, energise and cleanse the skin with a gentle scrub. Why? To remove the dead alcohol damaged skin cells and help boost circulation. The Origins GinZing Refreshing Scrub Cleanser is a 2-1 cleanser and exfoliator, it's gentle, refreshing, refines and smoothes. Its formula doesn't just have an uplifting citrus scent; it also includes radiance-boosting panax ginseng and caffine. And jojoba and carnauba wax gently exfoliates to help unclog pores. After cleansing it's vital to restore the skin's hydration levels as drinking = severe dehydration which in turn causes dry, irritated, dull and puffy skin. 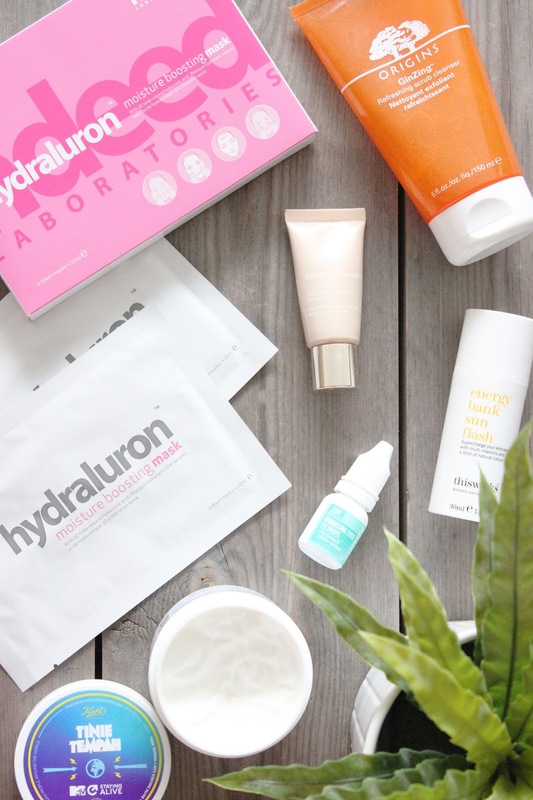 The Indeed Labs Hydraluron Moisture Boosting Mask is a seriously effective sheet mask that's saturated in hyaluronic acid. The mask is fuss free and comfortable to wear. Applied to the skin for 15 minutes, the sheet mask from Indeed Labs soothes the under eye area and leaves my skin noticeably softer, calmer, smoother, brighter and plumper. You can also massage the remainder of the serum from the sachet into the skin for an extra oomph of hydration. I also recommend GLAMGLOW Thirstymud Hydrating Treatment and if you're at your desk (bad times), opt for a spritz of hydrating water such as MAC Fix+, which contains a mix of antioxidants and provides a little moisture. Psst, these sheet masks are currently on offer online and in-store at Boots. Kiehl's Tinie Tempah Ultra Facial Cream £43.50* After you've treated your skin follow up with a moisturiser. The Kiehl's Ultra Facial Cream is a cult classic lightweight moisturiser that deeply hydrates. The smoothing moisturiser absorbs well, helps retain moisture, doesn't clog pores, is a great base for makeup, leaves the skin super smooth and is perfect for the cold winter months. A little goes a long way, so don't be too enthusiastic on application. Kiehl's UK will be donating £2 for each purchase of this limited edition Ultra Facial Cream to MTV Staying Alive Foundation. This Works Energy Bank Sun Flash £28.00* If your complexion is looking a little grey add a touch of colour back into your skin by blending a little This Works Energy Bank Sun Flash in with your moisturiser. The Energy Bank Sun Flash has a formula fit for a hangover as it includes vitamins C and E, caffeine, hyaluronic and natural caramel to give you that much needed sun kissed glow. It's not called This Works for nothing! Boots Pharmaceuticals Sparkling Eyes Eye Drops £3.59 Blood shot eyes are one of the biggest hangover telltale signs. So replace lost moisture and temporarily reduce redness by applying a few drops of Boots Pharmaceuticals Sparkling Eyes Eye Drops in each eye and after a minute or so you'll be bright eyed. Clarins Instant Concealer £21.50Finally skip foundation (dehydrated skin doesn't agree with foundation), but apply mascara and a little concealer if need be. The Clarins Instant Concealer tackles discolouration (a.k.a wine-induced blotchiness) whilst optically blurring dark circles with clever light-blurring pigments. Its formula contains both caffeine extracts to help the under eye area appear less puffy and aloe vera to soften the skin. It's also super easy to work with and provides a decent amount of coverage due to its rich pigmentation and most importantly it has a natural, brightening finish.